Info "We're looking forward to seeing your latest masterpiece! But, um, you've only got five seconds to make it." Carving Artist is one of Ashley's Microgames in WarioWare: Smooth Moves. This is a pun on the phrase starving artist. There will be some material. The player should chisel it to create a sculpture. Some of the creations include a bunny, a face, a bird, a robot, a human and a totem. 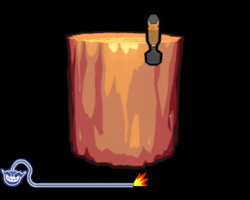 1st level difficulty: The object will be a bird or totem made of wood. 2nd level difficulty: The object will be a bunny or robot made of ice. 3rd level difficulty: The object will be a face or human figure made of rock. This page was last edited on February 19, 2018, at 22:37.